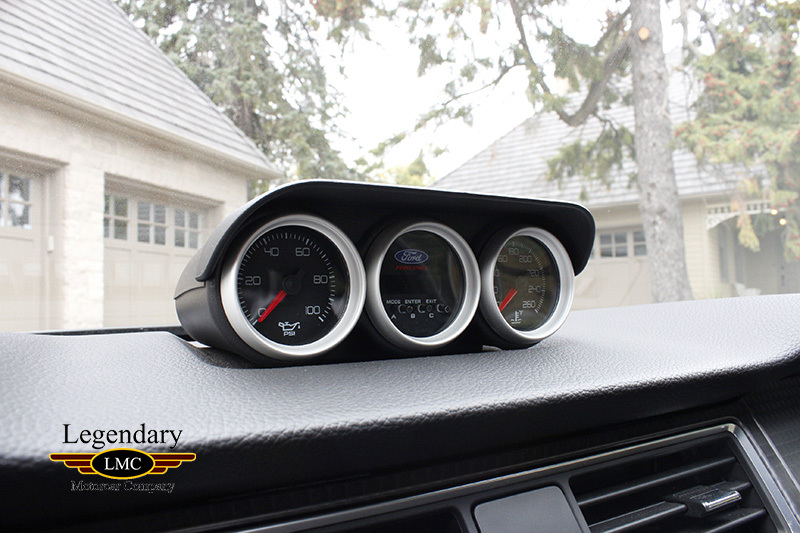 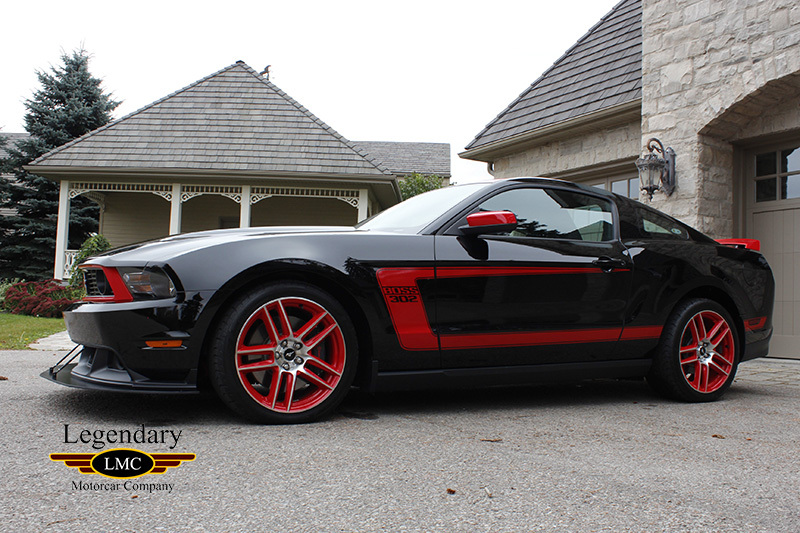 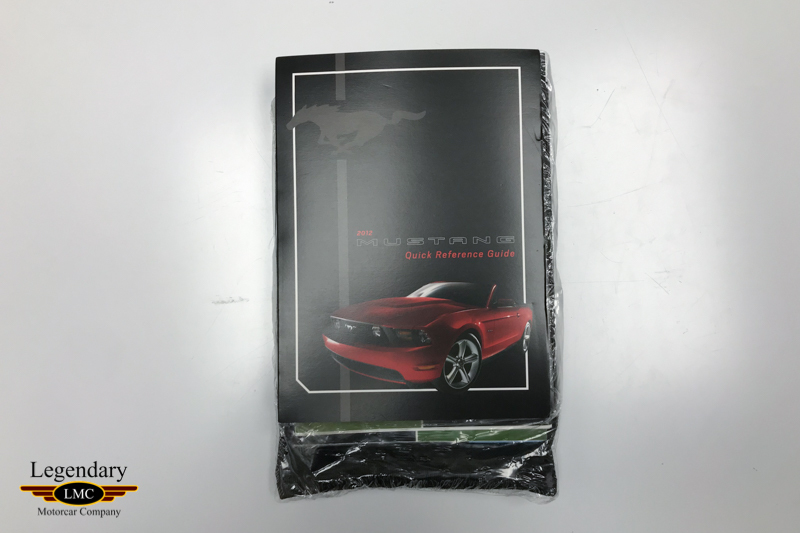 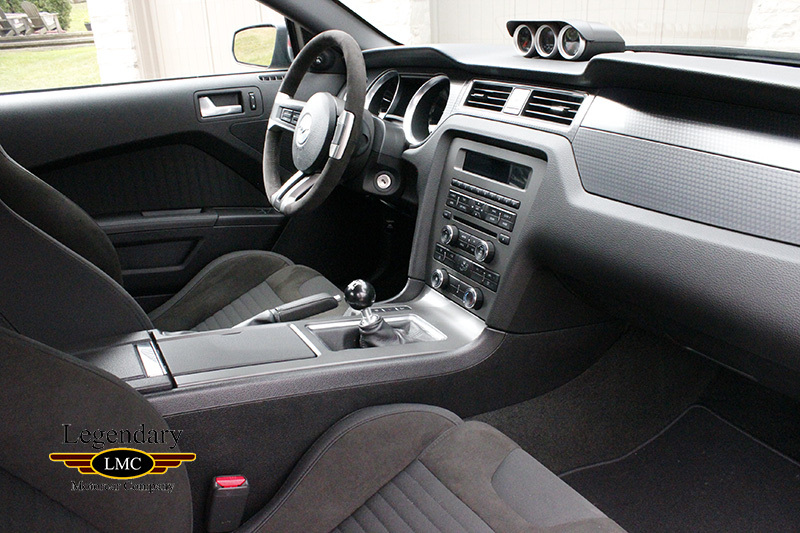 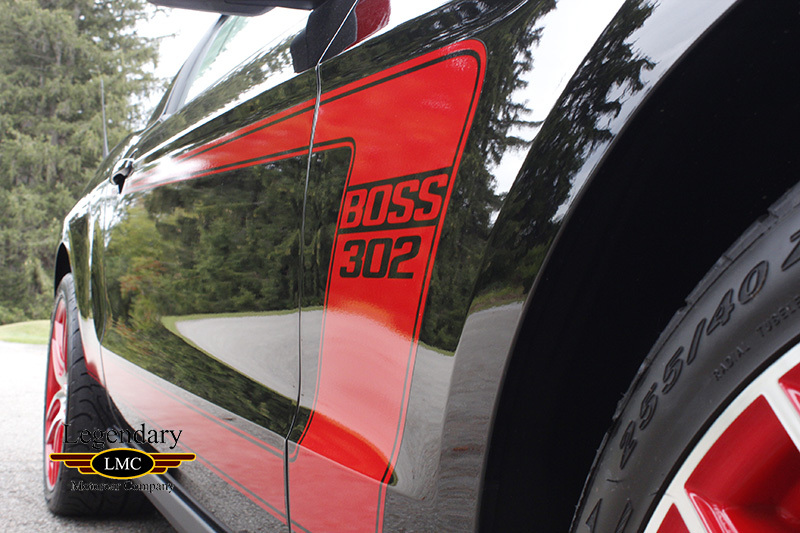 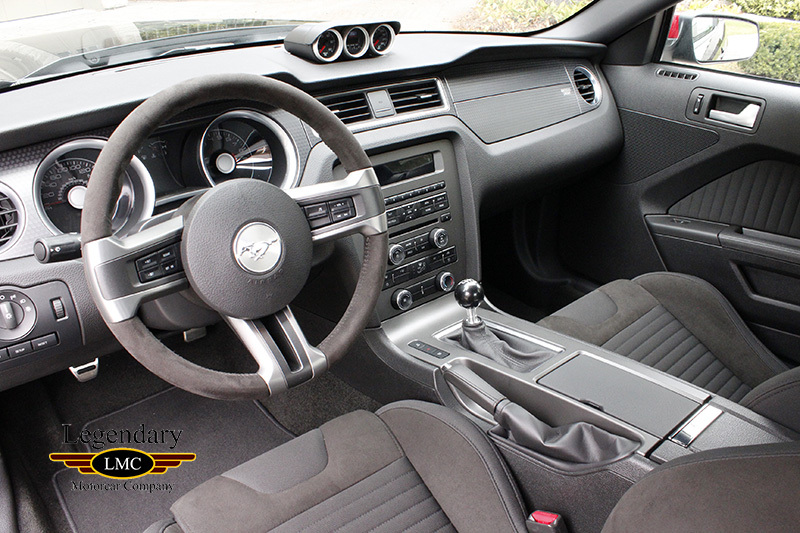 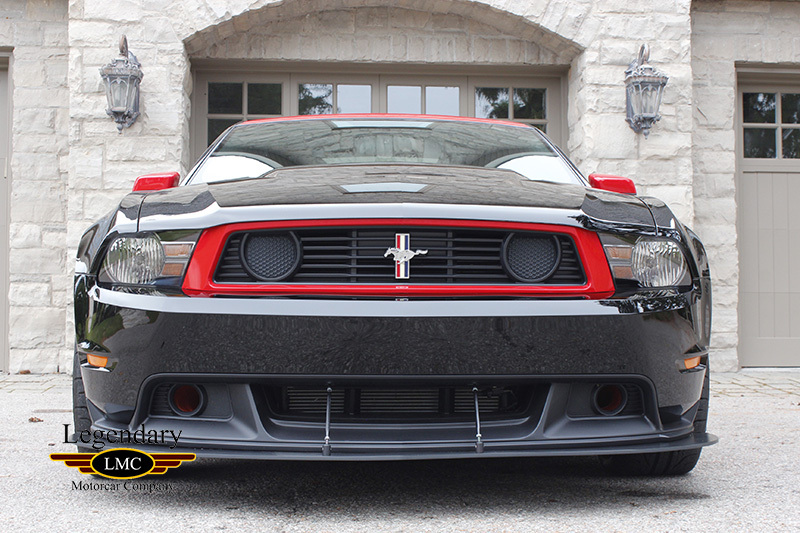 Click any thumbnail below to display the 2012 Ford Mustang BOSS 302 slide show. 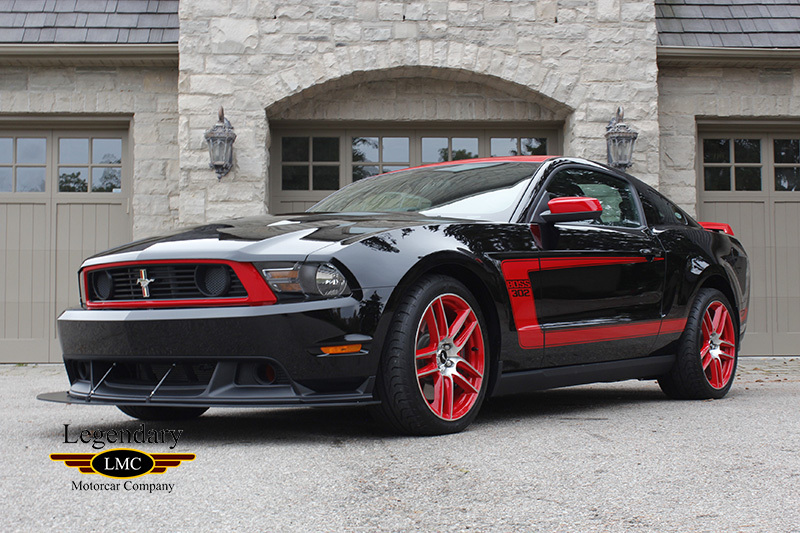 In 2012, Ford unveiled the all new track-oriented Boss 302 at the Rolex Historic Races at Laguna Seca. 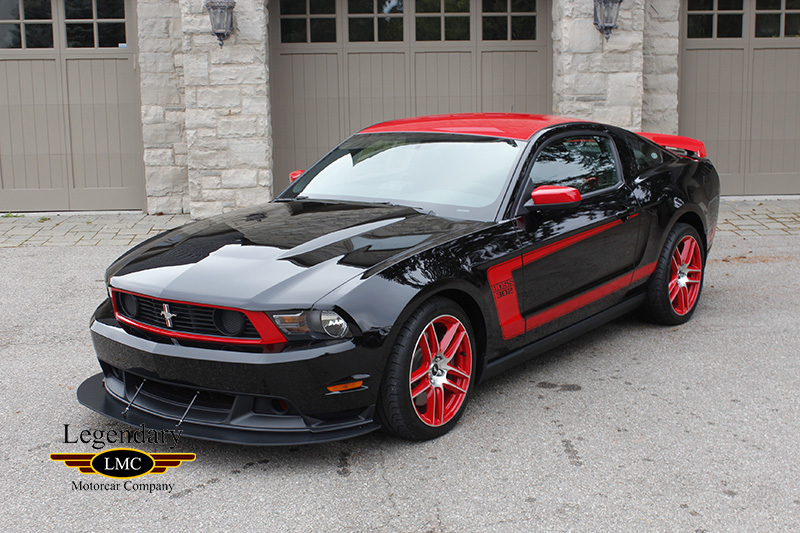 At the time, the 2012 Mustang Boss 302 Laguna Seca was the quickest, best-handling production Mustang ever offered by Ford. 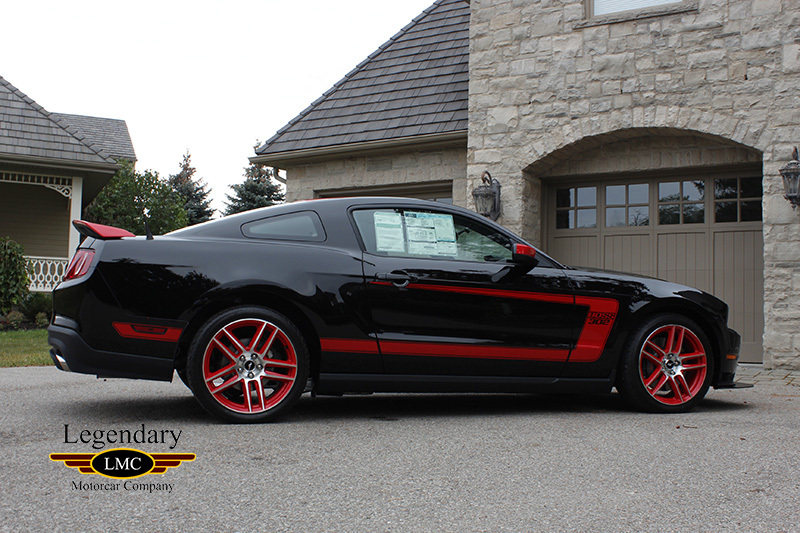 Ford used the already potent Mustang GT platform and increased the performance by lightning and strengthening key components, increasing the output of the engine, and wrapping it all in the vintage color schemes that Boss Mustangs are known for. 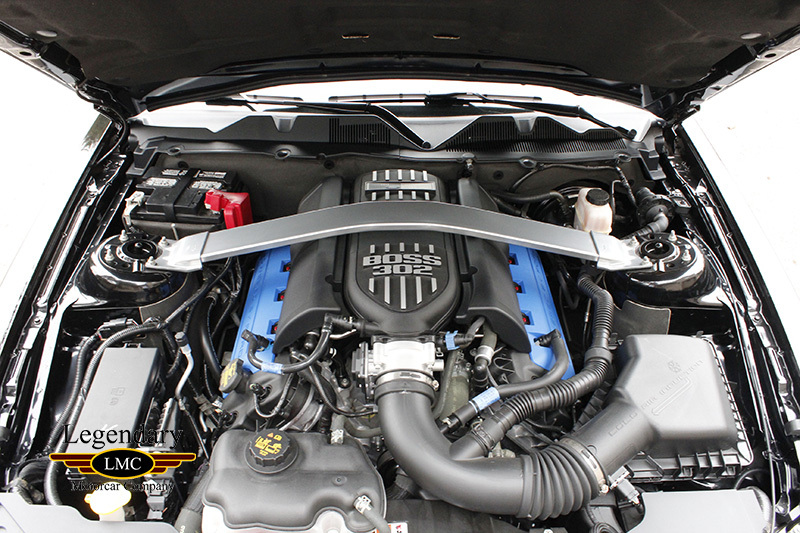 Powering the all new Boss is the proven Coyote 5.0-liter that has been upgraded with new intake runners, revised camshafts and more aggressive engine controls which raised output from the 412 hp to 440hp. 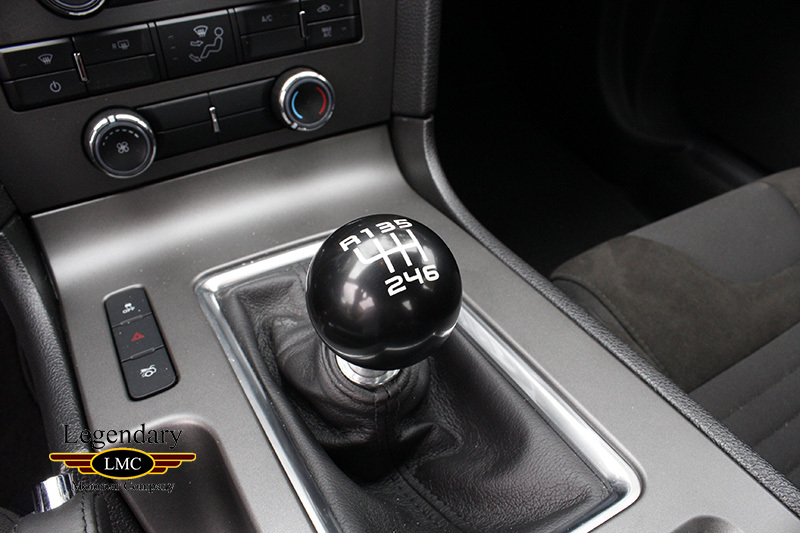 Power is delivered to the wheels through a short-throw six-speed manual transmission with a upgraded clutch, while the rear end packs a 3.73:1 axle ratio and carbon-fiber plates within the limited-slip differential. 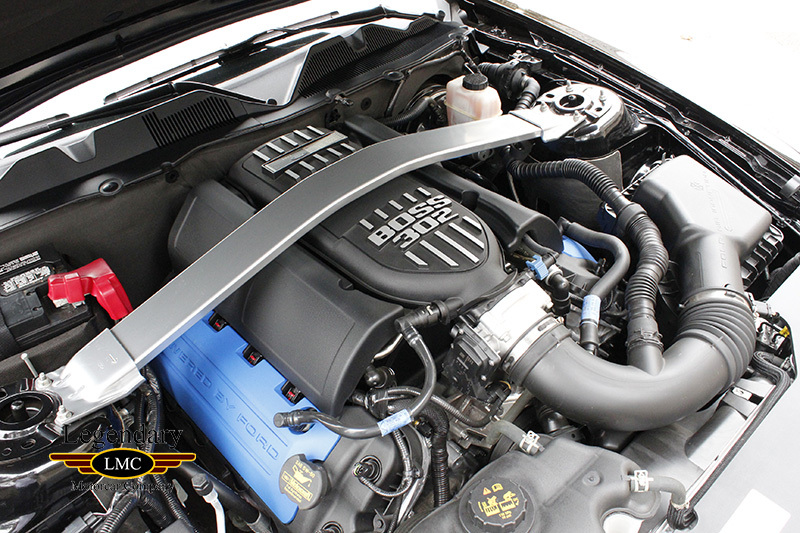 A unique exhaust system has been fitted to the Boss 302 which allow owners to remove restrictor plates and increase exhaust flow. 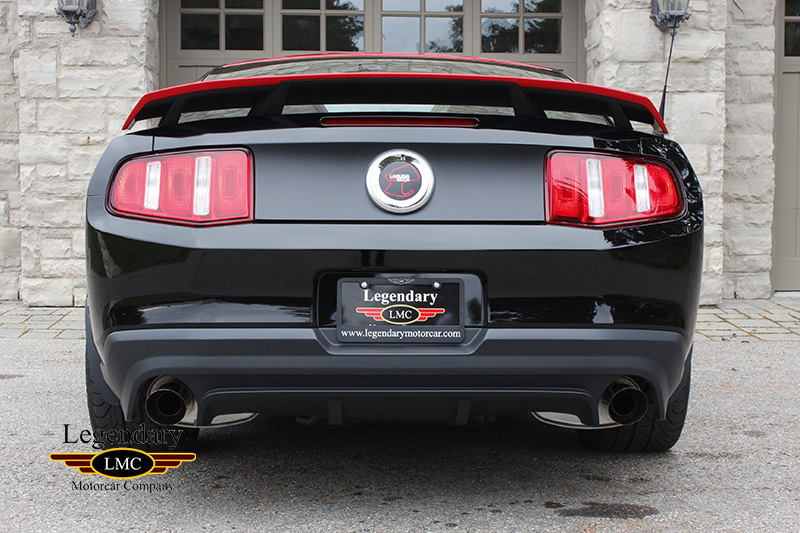 It has a regular dual-exhaust system, including a set of catalytic converters immediately aft of the engine and a pair of mufflers with two tailpipes poking through the rear valance. 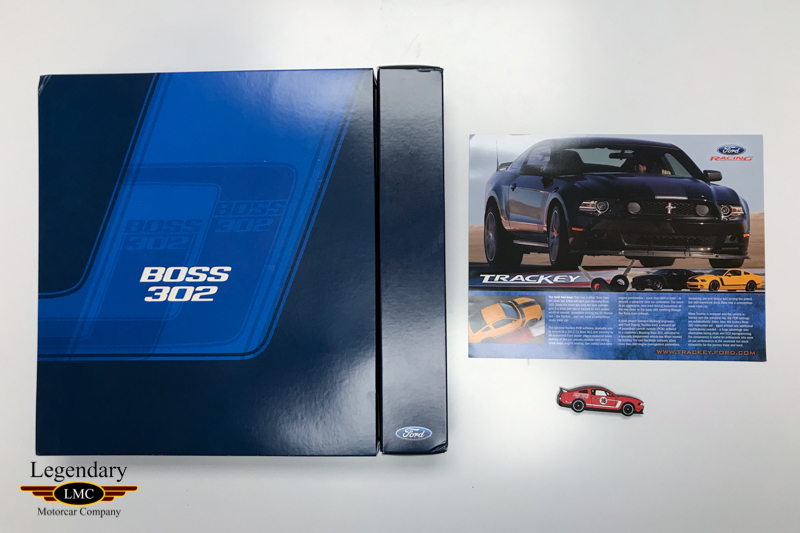 However, a second set of pipes branches off and allows you to bypass the mufflers and exit exhaust below the sides of the car in that is capped with a set of Restrictor Plates. 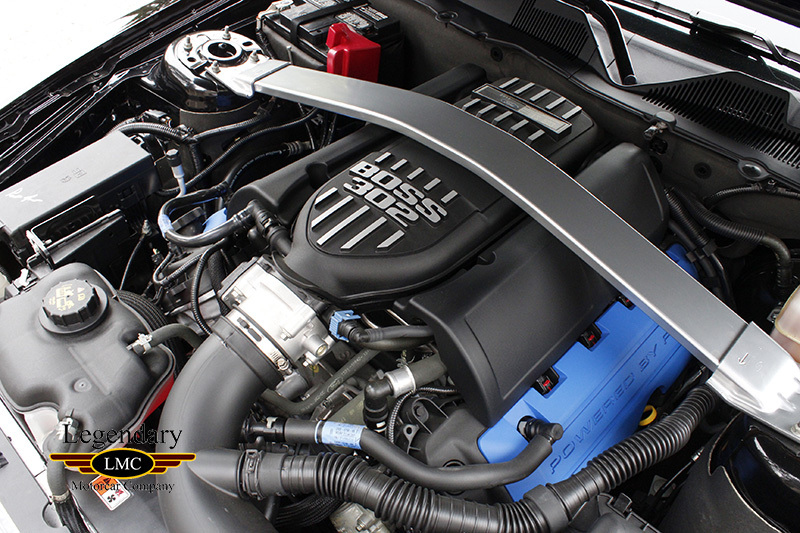 Removing the restrictor plates allows the engine to perform better and increases the volume of the exhaust. 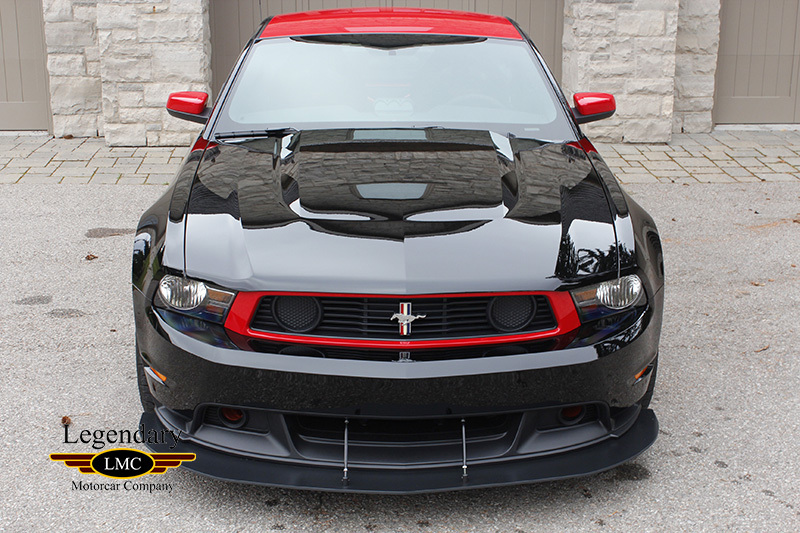 To help plant the power on track, aerodynamic changes have been made that include a deeper front air dam and a rear spoiler. 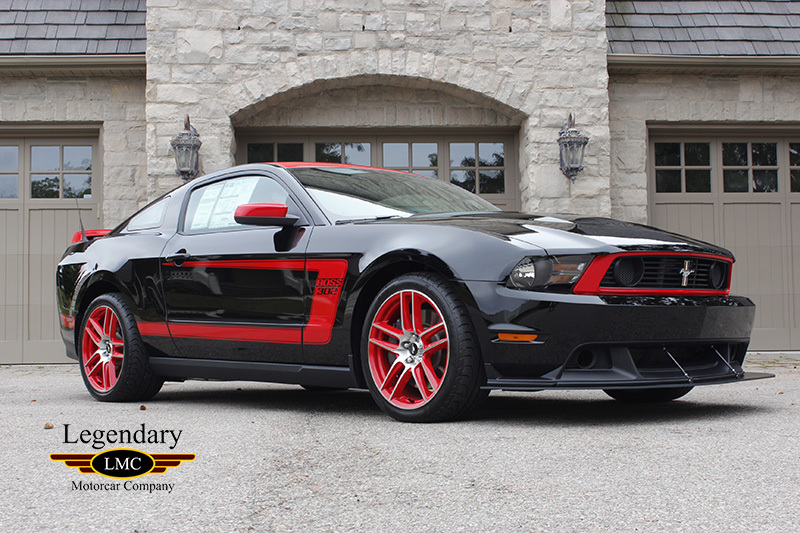 The Laguna Seca comes with special painted wheels measuring 19 by 9 inches in front and 19 by 10 in back wrapped in 255/40 front and 285/35 rear Pirelli PZeros. 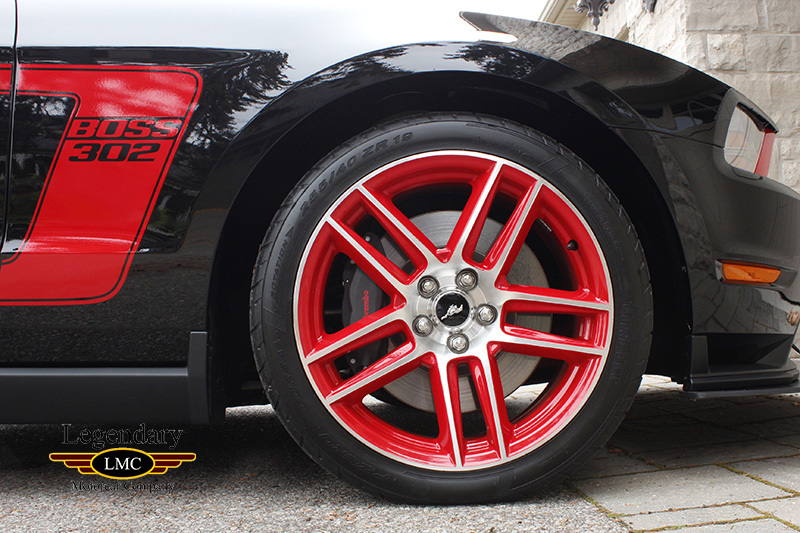 Brembo brakes are standard with high-performance pads and unique ABS calibration. 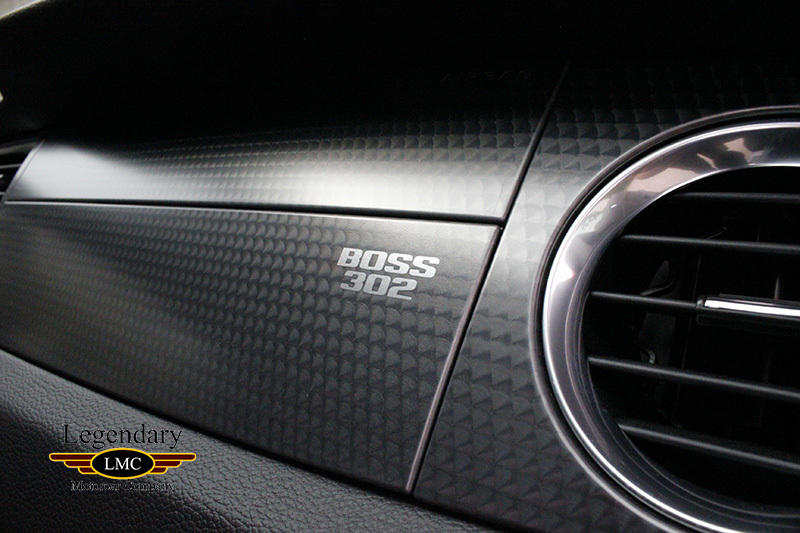 Inside the new Boss models receive an Alcantara-covered steering wheel, dark metallic dash and door panels, a black shift knob, and Recaro seats. 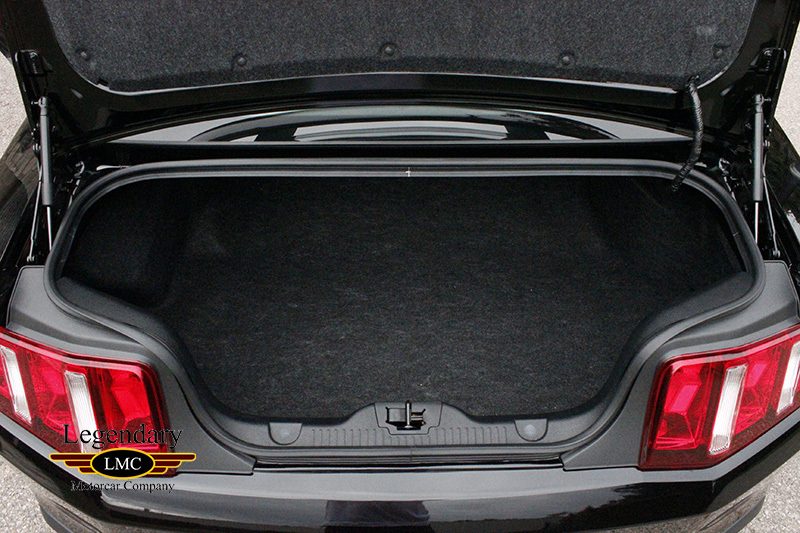 Eleven pounds of sound-deadening material are missing, to allow more of the engine’s uniquely tuned exhaust sound to fill the cabin. 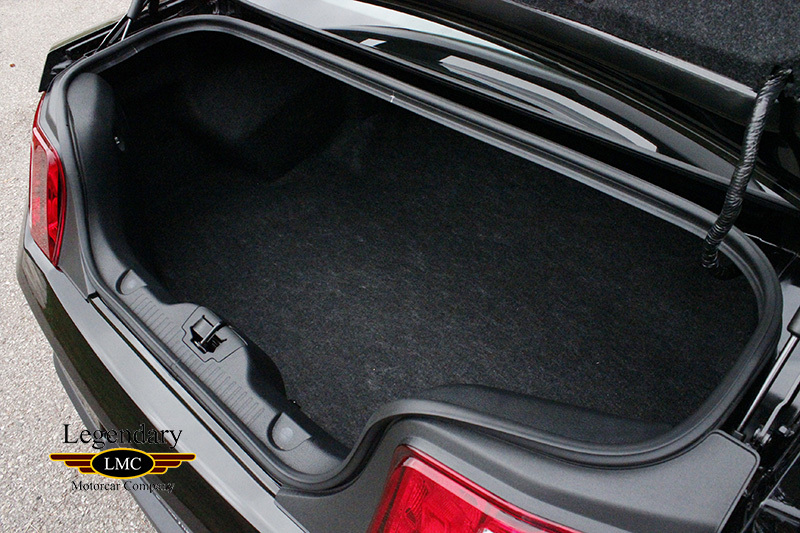 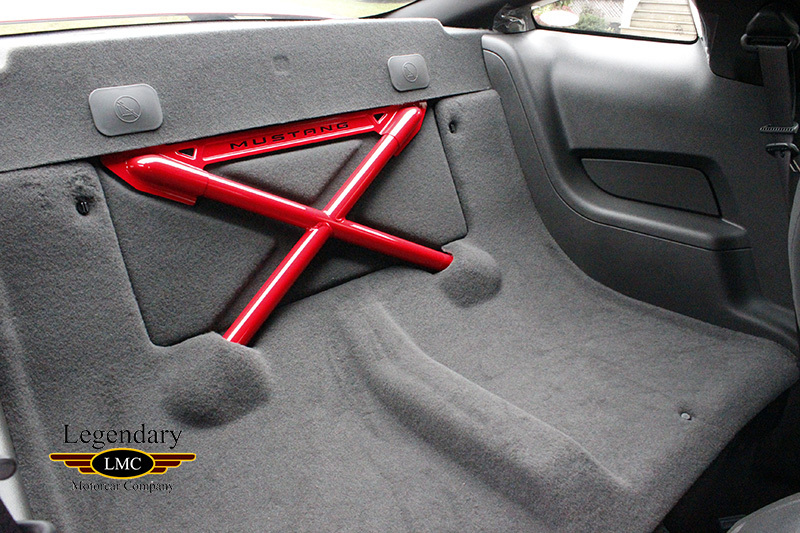 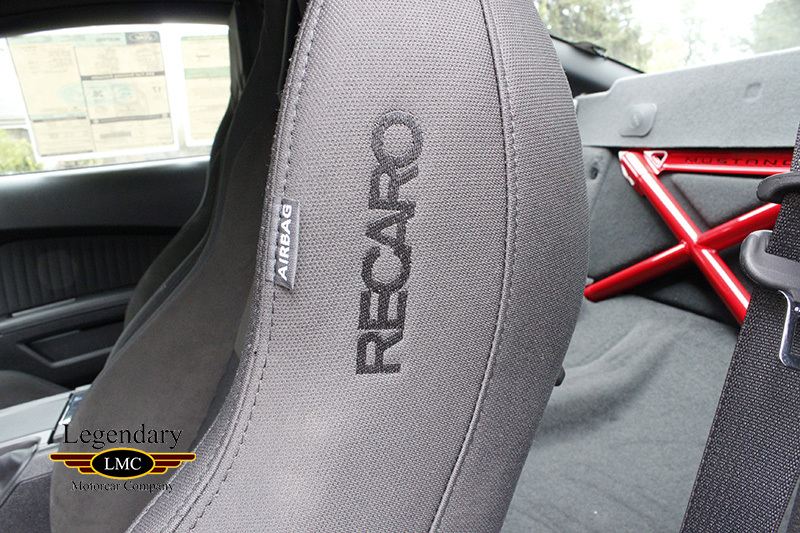 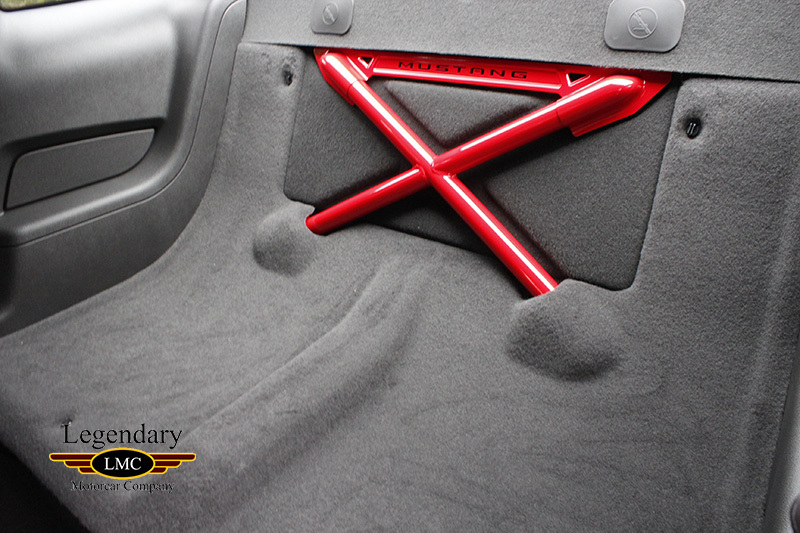 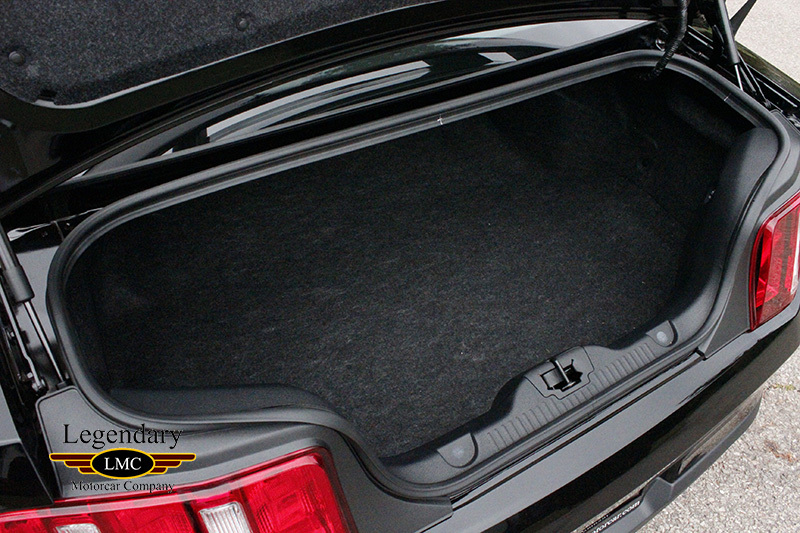 The rear seat has also been deleted and in its place a special X-brace to help stiffen the chassis. 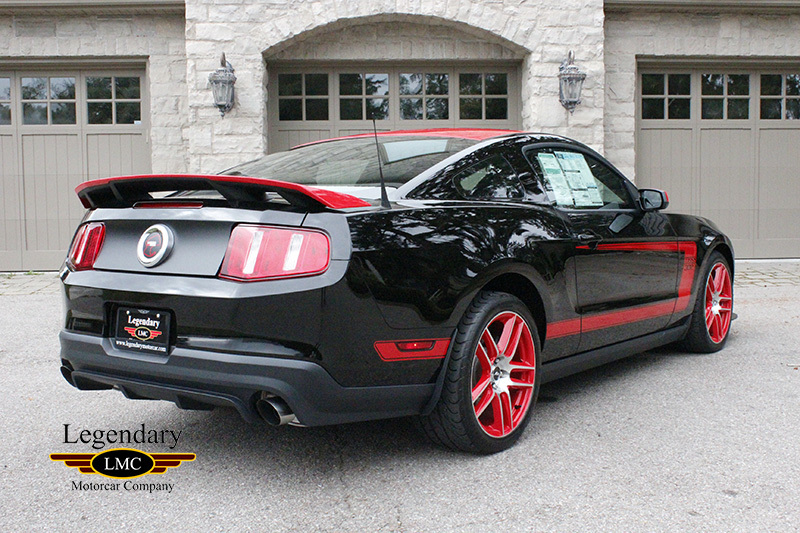 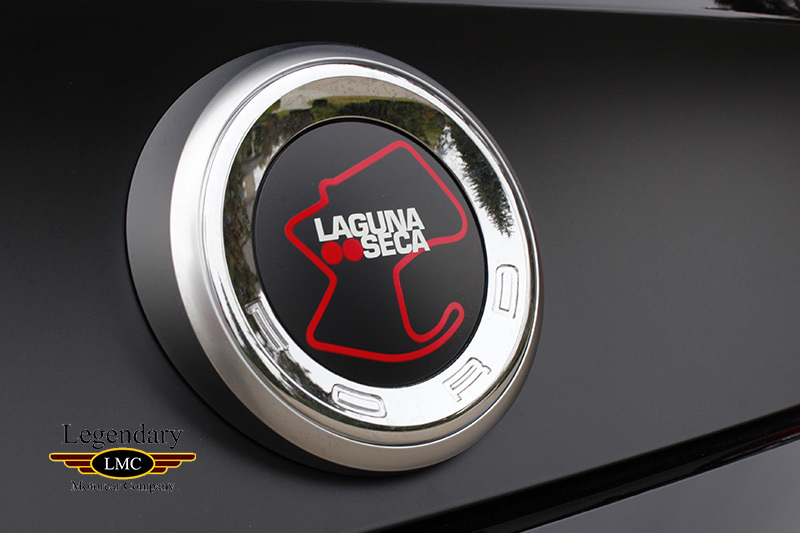 The Laguna Seca offered here for sale has been factory ordered in Black with Red accent package. 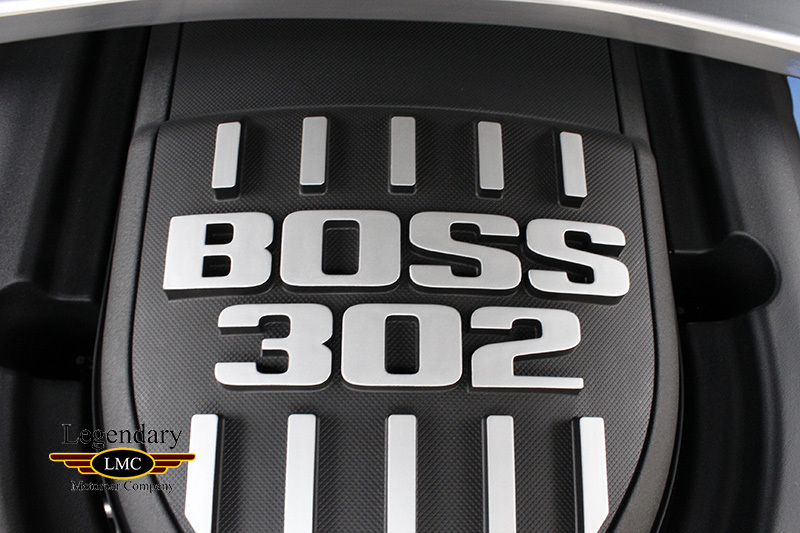 With only 351 miles on the odometer, this special Boss has been kept in showroom condition since new. 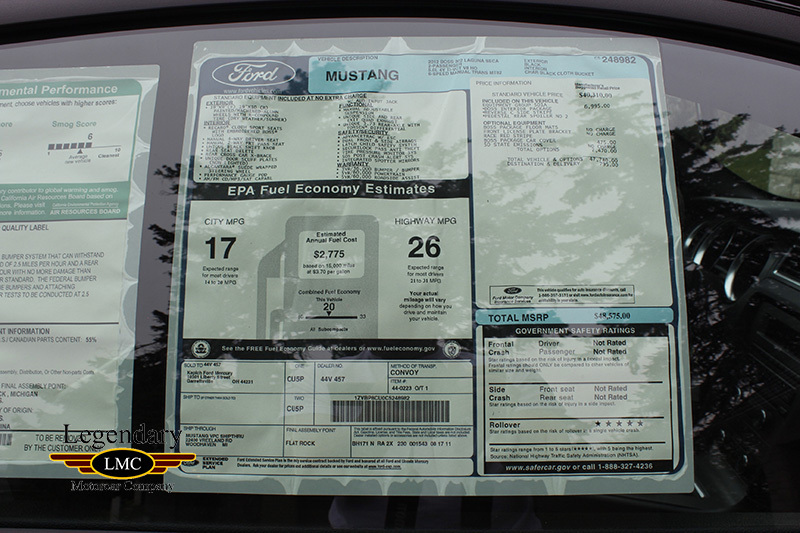 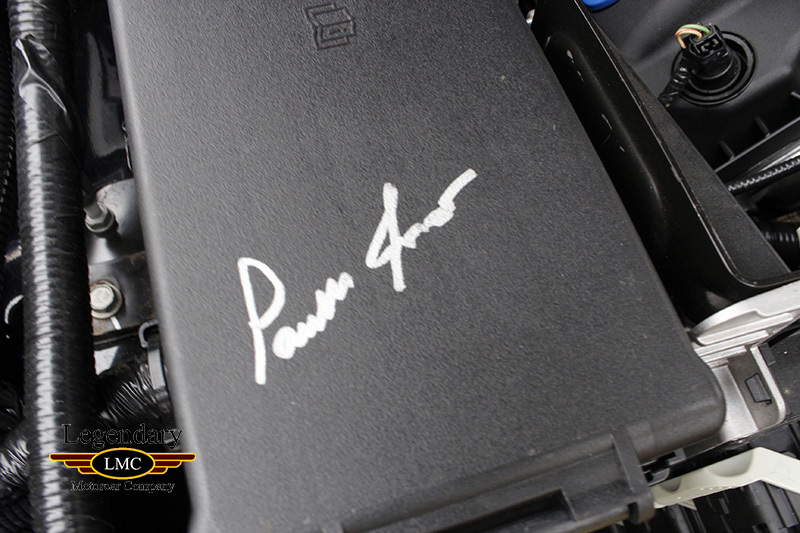 It also comes fully documented with original window sticker in place, owner’s manuals and Boss Owner’s Kit. 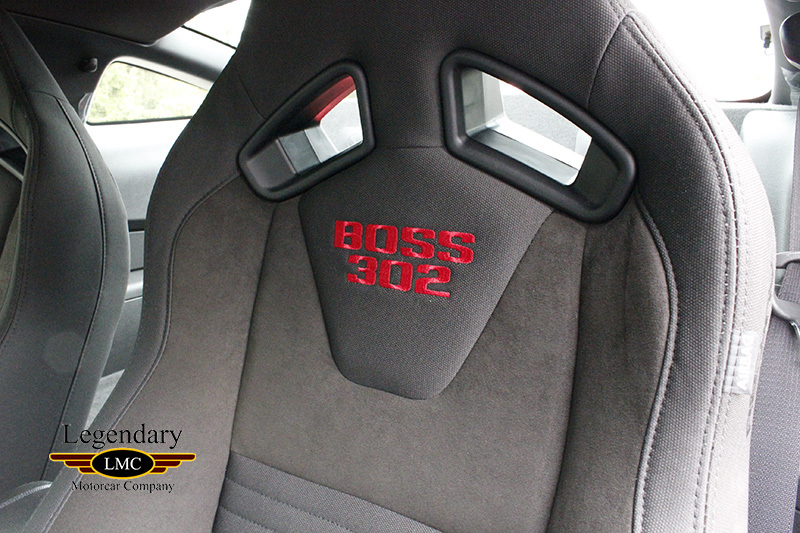 With all the right factory equipment, performance enthusiasts will enjoy the experience of driving this track ready Boss Laguna Seca! 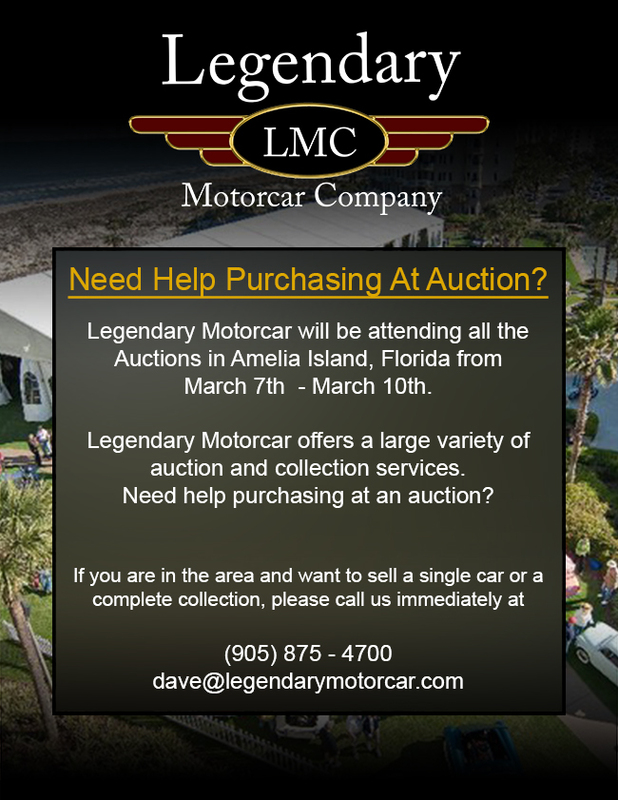 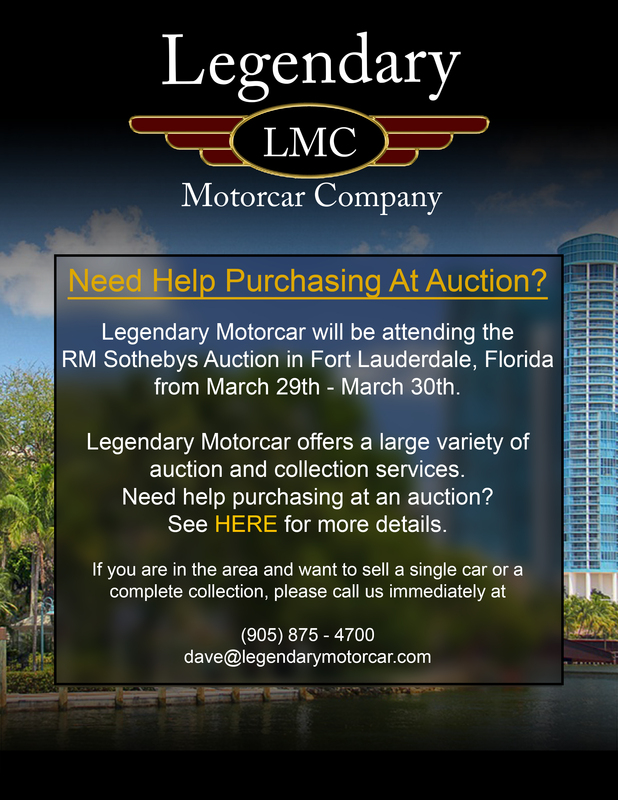 Legendary-Motorcar-Company-Ltd-2018-227 Ford 2012 Ford Mustang BOSS 302 2018-227 0 Legendary Motorcar Company Ltd.